Clearly visible trend is the key to successful trading. 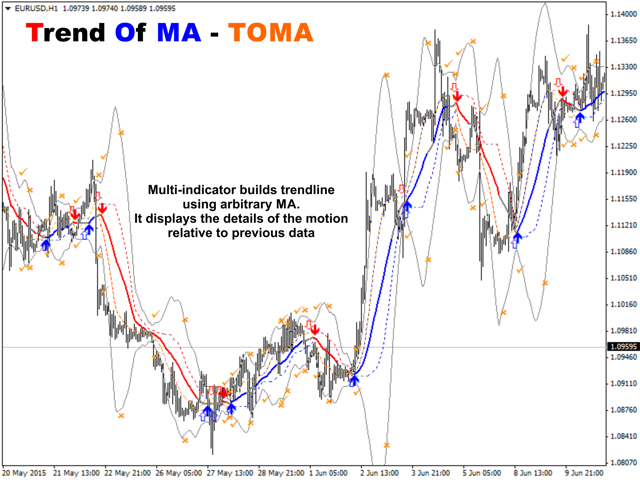 The TOMA (Trend of MA) indicator shows the nuances of behavior of the trend line built according to the moving average. 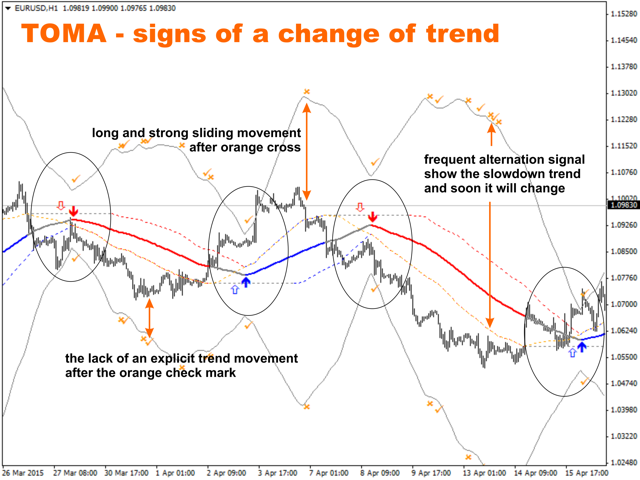 The indicator shows trend direction, generates signals about trend strength, possible change of movement and confirmation of a new trend. Experienced traders assure that one moving average is quite sufficient for sustainable trading. 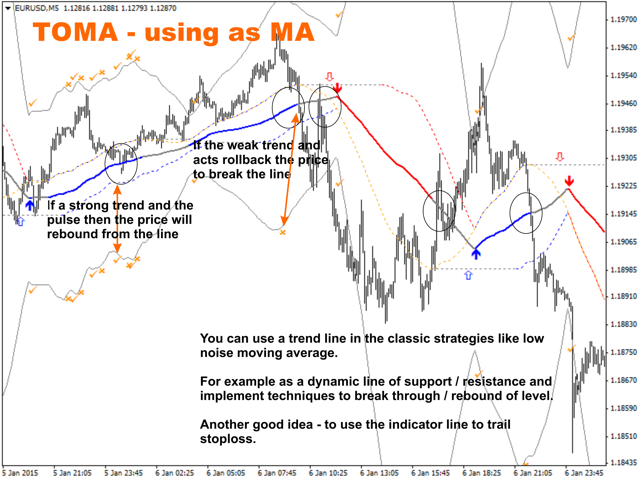 Trend of MA will help you to understand how to use MA in trading, and develop and improve your own strategies. When you imagine the price movement as a moving average, behavior of this line towards history becomes essential. The indicator shows updates of Highs/Lows of this line and plots a trend line based on these data. 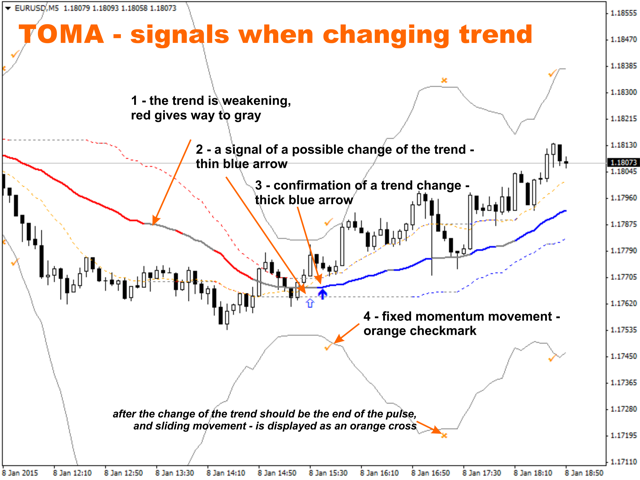 Using the trend line, its direction and color, and signal strength you can see beginning, confirmation and change of the trend. Use these moments as a support for creating your strategies. Lines similar to B.bands help to visually assess the movement strength. 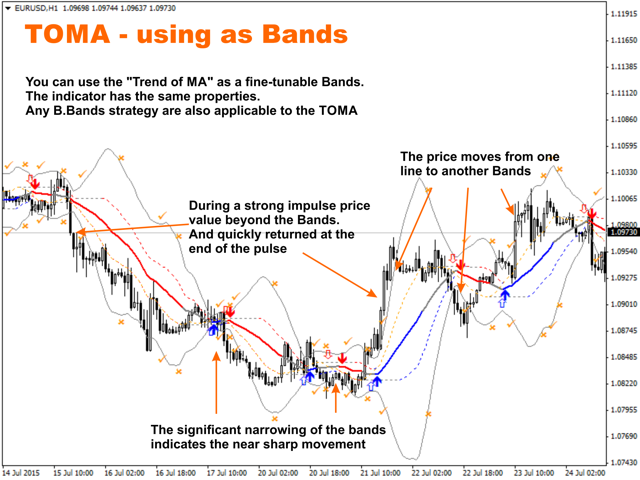 Standard Bands strategies can be applied to TOMA as well. The indicator does not repaint. It works on any symbol and timeframe. TREND - trend line based on MA. Displayed in three colors. Blue color means steady upward movement, red color means steady downward movement, and gray color indicates tentative movement and possible trend change. UPPER BAND, LOWER BAND - upper and lower bands. Show relative growth of lows/highs. Fixed momentum - yellow check mark near BAND lines. Indicates distance increase between MAXHIGH and MINLOW. Confirms trend direction. Momentum end - yellow criss cross near BAND lines. Indicates distance decrease between MAXHIGH and MINLOW and a rollback movement. It is often a spot of a new trend beginning.